Hire by mail from $10 per day (postage included). Why hire a PLB from The Bushwalking Blog? Prices from $10 a day. Simple booking and return process (return postage included in price). 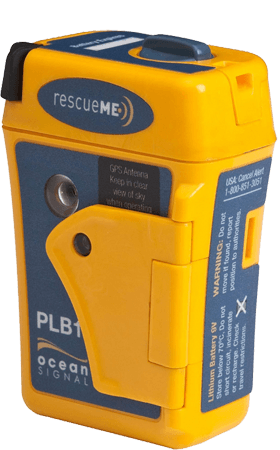 The RescueME PLB1 is the world’s smallest PLB (weighing only 115g). Hire a PLB for your next wild adventure, so your family can rest easy. It might even save your life. On the calendar below, click the first and last day of your booking. A form will appear beside the calendar, including the total cost. Enter your details. Make sure you click the “Terms and Conditions” link, read the terms, and tick to indicate that you agree. Click “Book Now” and you will be taken to Paypal to complete your payment (PayPal account not necessary). How do I get my hands on the PLB? This is a mail order PLB hire service, so the emergency beacons are sent via Express Post. In most cases, I can get one to you within a couple of days. Included in the package will be a self-addressed Express Post satchel to return your PLB. How does the pricing work, exactly? Bookings of 6 days or more will be $10 per day. For any booking less than 6 days, the maximum will be $15 per day (for a 3-day booking). This is the base rate, which will reduce with each day of the booking up to the sixth day. How do I decide when to start and end my booking? The first day (or start date) of your booking should be the day AFTER you need to receive the PLB. You do not pay for the day that you receive it. The last day (or end date) of your booking should be the day BEFORE you intend to put the PLB back in the mail. Again, you do not need to pay for the day you return the PLB. The last day of your booking must NOT be a Saturday and the first day must not be a Sunday. This is due to there being no mail service on weekends. Public holidays also effect booking dates. You must count public holidays into your booking dates. Do you provide EPIRB hire? The short answer is no. However, although many people stumble across this service looking for EPIRB hire, a large percentage of them are actually looking for a PLB. EPIRBs are intended (mandated actually) for use on boats. A PLB is what you’re looking for if your adventure will be land based. PLBs don’t need to float (FYI, our PLBs do come with a flotation pouch if that’s something you think you might need), so the PLBs we hire are smaller and lighter than any EPIRB. Click here to check out a step-by-step outline of the entire process. Hopefully, that will help. If not, scroll down and get in touch via the contact form or e-mail me at neil@bushwalkingblog.com.au. I need to hire some other hiking gear. Where should I go for that? There’s a great guide to hiking gear hire in Australia and New Zealand over at Hiking in Australia and New Zealand.